In 1993 George realised that many perfectly good showers were being consigned to the scrap heap, often because the average plumber or electrician had no in-depth knowledge of how they worked or more often they had difficulty in locating and obtaining spare parts. George started The Shower Doctor to remedy this. Over the subsequent years the repair business expanded and so did the stock holding of spare parts. Other contractors heard that most of the parts that usually go faulty in a shower could be bought off the shelf, and the more obscure parts could normally be sourced within a few days. As the over the counter and internet sales grew, the business has expanded to the extent we now have 18 employees dedicated to spare part sales, customer support and shower repair. 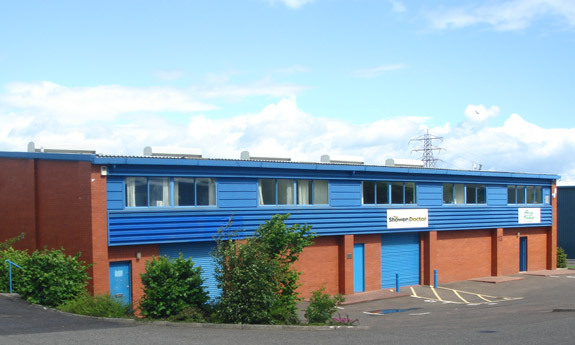 The continued growth meant that in April 2008 the company with its staff moved to new custom designed office/warehouse unit at Hailes Park Industrial Estate in Edinburgh. Our dedicated team are here to help and are more than happy to answer any queries you may have. The Shower Doctor has five engineers that exclusively carry out shower servicing and repairs and therefore have a wealth of experience of the problems encountered with faulty showers. If you have any comments or criticisms of our products or service, please do not hesitate to contact us by phone on 0131 538 4343 (Mon-Fri 9am-5pm), email info@showerdoc.com or use the contact form available here. If our FAQ Guides can't help then send us an e-mail and we will do our best to assist you (Please provide details of the make, model and age of your shower with your correspondence).